The Postgraduate Diploma in Public Health (DPH) is a broad-based qualification which is highly sought after by a range of employers. It is relevant and practical, with graduates being able to identify and understand public health issues, and depending on which optional papers are taken, gain the skills to analyse and use health data, design appropriate health promotion strategies, plan and evaluate public health interventions, work collaboratively with professionals and the community, appreciate resource allocation and cost issues in health and uphold ethical standards. The DPH consists of four core papers, with a further four papers chosen from the schedule enabling the qualification to cover a broad range of public health topics. Many students will complete an unendorsed DPH, however there are three endorsed options for those with specific interest areas in epidemiology, health promotion, or social research methods. The DPH can be used as a stand-alone qualification, but equally you can use the papers from the Diploma to progress to the Master of Public Health (MPH). Note that candidates for the MPH must have attained at least a B average overall in their DPH. Note: For those who are planning to go on to a Master of Public Health (MPH), an approved 15 point PUBH research methods paper relevant to the intended methodological approach needs to be included as one of the optional four papers. This is in addition to the core epidemiology paper, PUBH 711 Principles in Epidemiology. PUBH research methods papers are marked with an * in the list above. Two further PUBH papers to the value of 30 points. 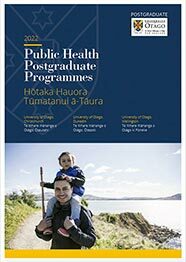 * The Postgraduate Diploma in Public Health (DPH) endorsed in Health Promotion is recognised by the Health Promotion Forum of New Zealand for providing advanced knowledge and understanding of the Nga Kaiakatanga Hauora mo Aotearoa Health Promotion Competencies for Aotearoa New Zealand. One further PUBH paper to the value of 15 points. Enrolments for the DPH are always open. Papers begin in February, April, July and September each year. When you’re ready, click the ‘Apply Now’ button in the top right hand corner of the webpage for the programme you wish to enrol in. This takes you to eVision where you will create your 'student portal'. Your eVision portal will be your one-stop shop for study-related information. Using eVision you can apply to study, access all important study-related information, examination results, and maintain your personal information. eVision is accessible anytime, anywhere using the internet and mobile devices. If your first language is not English you must provide evidence of a satisfactory level of English language proficiency. Entry into the Postgraduate Diploma in Public Health requires an IELTS of 7.5 before an application for the programme will be considered.